One of the best things about being vegan in the UK is the access to an abundance of clearly-labelled, cruelty-free alcohol. As I have mentioned previously, alcohol is often made with the aid of animal by-products. The most common way this occurs is during the fining process of beer, cider or wine. A large vat or container of drink contains much unwanted organic matter that needs to be filtered out before it can be sold. Egg, bone, fish stomach or sometimes milk protein is used to create a film that is sprinkled over the product. As the dead animal remains sink and pass through the booze, the organic matter is dragged down leaving the final product. Sounds tasty, right? The above description is my take on what is a rather complex process. If you are a brewery technician and can add finer detail to this explanation, please enlighten us. The good news is a large number of booze producers are opting out of this grisly practice. Increasingly here in the UK, a recreational drinker such as myself can walk into the local supermarket and experience no trouble in finding vegan drinks. My latest liquid favourite is a box of cider… yes a box. 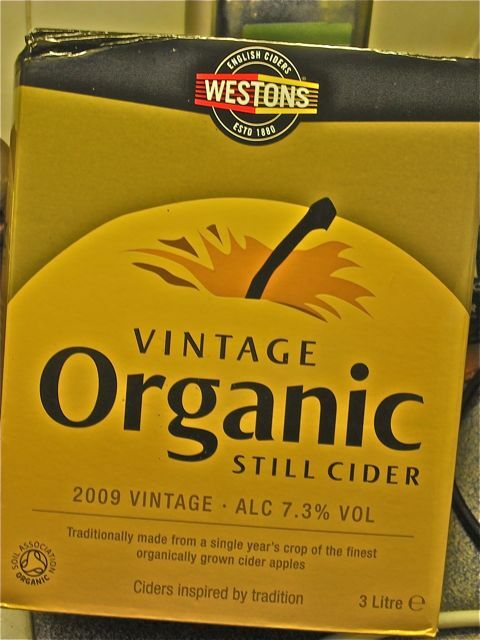 This casked apple cider by Westons is organic and the box clearly states its suitability for vegans. 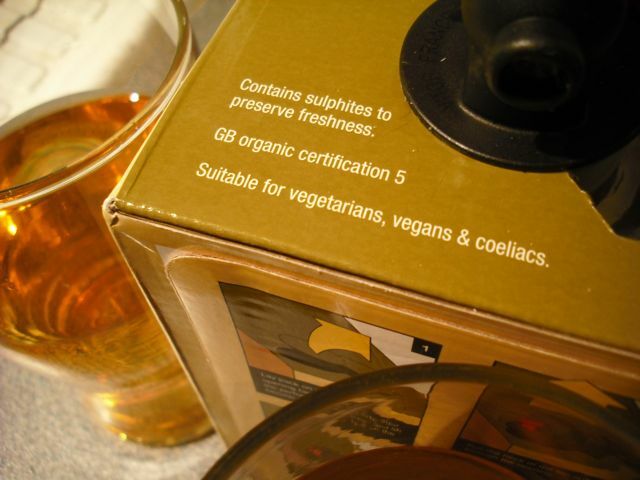 3 litres of delicious, aged apple cider in a bag-in-a-box with a mini tap. What’s not to love? If you fall in love with this product as I have, why not take a trip to the Westons visitor centre in Herefordshire? Maybe we can catch the coach together. Check the Westons website for details on the visitors centre and their cider-making process. Wow, thanks for bringing this issue to light. I had no idea about the use of animal products in alcohol making. Good thing I don’t drink, so I don’t have to worry about it (I’m no fun, am I?). At least you can now help educate friends who do drink. I often have trouble finding vegan alcohol during my trips to the US. The labeling is not so advanced as it is in the UK.